2. Select to view the details of a service provider by clicking on the READ MORE button next to the service provider offer. 3. Check the terms and conditions for the service provider offering to ensure that you meet the specified criteria. 4. Click on the PRINT VIRTUAL VOUCHER button to generate a virtual voucher with your personal details on it. Once generated, remember to print the voucher so you can redeem it in-store. 5. Take your printed virtual voucher, along with your ID or Driver's License, and present it in-store at the service provider to receive your discount. 2. 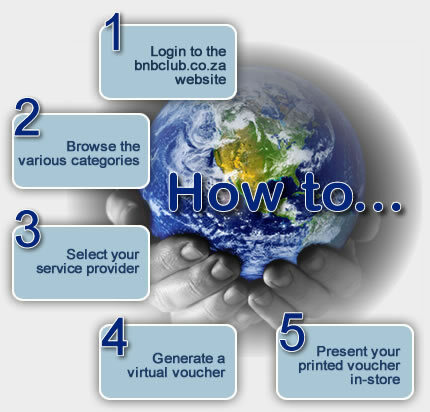 The BnB Club call centre on (011) 232 9340, where a friendly call centre agent will guide members through available services and accessing the offers on your behalf or assisting members with booking services. Always make sure that you read the ‘’Redemption’’ information as this will show you how to access the provided offer. BnB Club provides a number of services which requires members to make a booking for, such as airline tickets, accommodation or car rentals. For these services, members need to contact the BnB Club call centre on (011) 232 9340 where one of the friendly BnB Club call centre agents will provide members with assistance in making bookings for these services. Our friendly call centre agents will also provide members with guidance as to the services available and will even generate vouchers on the members behalf and forward the voucher to the service provider prior to the members arrival. Talk about service!